Picture - Henri Fabre on Hydroplane, 28 March 1910. Henri Fabre (November 29, 1882 - June 30, 1984) was a French aviator and the inventor of Le Canard, the first seaplane in history. Henri Fabre was born into a prominent family of shipowners in the city of Marseilles. He was educated in the Jesuit College of Marseilles, where he undertook advanced studies in sciences. He then studied intensively aeroplane and propeller designs. He patented a system of flotation devices, which he used when he succeeded in taking off from the surface of the Etang de Berre on March 28, 1910. On that day, he completed four consecutive perfect flights, the longest about 600 meters. "Le Canard", has survived and is displayed in the airport at Marseilles. 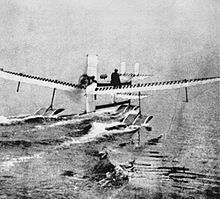 Henri Fabre was soon contacted by Glenn Curtiss and Gabriel Voisin who used his invention to develop their own seaplanes. During the First World War, he established a company with 200 employees, which specialized in the manufacture of seaplanes. As late as 1971 the aged Fabre could still be seen sailing his own boat single handedly in Marseille harbor. He died at the age of 101, as one of the last living pioneers of human flight.